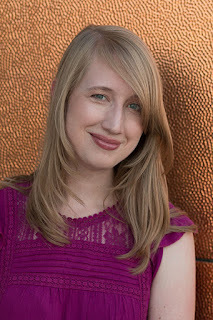 Today, I'm so excited to have Joanna Ruth Meyer stopping by the blog to discuss her Beauty and the Beast and East of the Sun, West of the Moon mash-up retelling, Echo North. Can you tell us a little about Echo North? What kind of a retelling of Beauty and the Beast and East of the Sun, West of the Moon is it? Echo North is a re-imagining of East of the Sun, West of the Moon, starring a girl with a scarred face, a white wolf (instead of the white bear like in the original), and an enchanted library filled with books you can literally step into. The setting and landscapes are inspired by 19th-century Siberia, and I’ve borrowed a big element from the Scottish ballad Tam Lin for the ending! Why Beauty and the Beast and East of the Sun, West of the Moon? What drew you to these fairy tales? And what inspired you to retell it? Beauty and the Beast has always been my favorite fairy tale, with East of the Sun a very close second. Both fairy tales have their roots in the older myth of Cupid and Psyche, and all contain elements of a girl going to live with a beast/monster in a castle. I love the dogged bravery of the heroine—her ability to see past the monster, or, in East of the Sun and Cupid and Psyche, embark on an impossible journey, and literally save someone with the power of her love. I honestly never thought I’d be brave enough to do a retelling of my own, with all the stellar ones already out there, but I was drawn to Echo’s story—the story of a scarred girl who, for a time, considers herself a monster because of her appearance, and because of the cruel people around her who tell her her scars make her worthless. What do you bring to the Beauty and the Beast and East of the Sun, West of the Moon stories with Echo North? Hopefully a retelling that stays true to the spirit of the original stories while bringing something fresh in the characters of Echo, Hal, the white wolf, and Ivan the storyteller… Also, an enchanted library! How does Echo North differ from other retellings of Beauty and the Beast and East of the Sun, West of the Moon out there? Like I mentioned a little earlier, I borrowed a big element from Tam Lin for Echo North, which changes the ending, as well as adding a [SPOIELRS REDACTED]. In the end, Echo North is a story for people who love stories, and I hope my love of fairy tales and books really comes through! It was definitely daunting retelling a fairy tale so many wonderful authors have retold before me... While drafting, I didn’t re-read the source material and I didn’t read any other retellings so I could focus on Echo’s story and let it take me where it wanted to. It was comforting to have a basic plot structure to fall back on, although there were some challenges inherent to the fairy tale, like: What am I supposed to do with a girl and a wolf alone in a house for a year? After finishing work on Echo, it was interesting to read some other retellings and see how other authors tackled these same problems! What do you hope readers get from Echo North? That you are more than your appearance; that others’ opinions of you don’t define you; that you are braver and stronger than you think. A story that stays true to the original in spirit, but offers either a unique take, has something new to say about it, explores different aspects of the source material, or just retells it in a rich, beautiful way. Are there any retellings you would recommend, either of Beauty and the Beast and East of the Sun, West of the Moon, or in general? Absolutely! 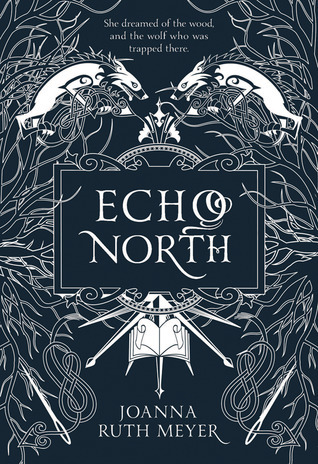 Three books that were instrumental to the creation of Echo North are Beauty, by Robin McKinley (Beauty and the Beast), East, by Edith Pattou [called North Child in the UK] (East of the Sun, West of the Moon), and Fire and Hemlock by Diana Wynne Jones (Tam Lin). Other Beauty and the Beast retellings that I adore are: Cruel Beauty by Rosamund Hodge and Hunted by Meagan Spooner. Ella Enchanted by Gail Carson Levine is an oldie but a goodie (Cinderella), and The Forbidden Wish by Jessica Khoury is stunning (Aladdin). I hope readers will fall in love with Echo’s story just as much as I did. 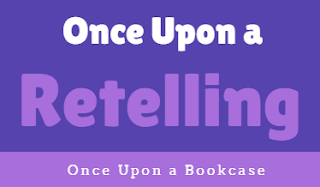 Thank you so much for having me on Once Upon a Retelling! Thank you, Joanna, for such a fantastic interview! I am so excited for Echo North! It sounds enchanting, and that cover is just gorgeous! Be sure to visit Joanna's website, follow her on Twitter and Instagram, and check out Echo North, which is published today! In his enchanted house beneath a mountain, Echo discovers centuries-old secrets, a magical library full of books-turned-mirrors, and a young man named Hal who is trapped inside of them. As the year ticks by, Echo must solve the mystery of the wolf’s enchantment before her time is up—otherwise Echo, the wolf, and Hal will be lost forever. From Goodreads.